TOP-QUALITY JAPANESE "F.E.W." BRAND POINT SETS Will fit: CT90 (62-72;74-79); SL100 (69-72); ST90 (73-75); It fits other models see the full web description for all models. Replacement Carburetor Float Set. Will Fit: CT70 1970-1977; CT90 1966, 1969-1977; ST90 1973-1975; ATC70 1973-1974. It does fit other Honda models. It is #4 in the diagram. CT90/ST90 Cylinder Head Cover Gasket- #5 in diagram. Will fit: CT90 1966; 1969-1979; ST90 1973-1975. CT90/ST90 Point Cover Gasket-#18 in diagram. Will fit: CT90 1966; 1969-1972; ST90 1973-1974. Fuel Tank Pad. Sold individually. Will fit CT70 1972-1994 and ST90 1973-1975. It is #3 in the diagram. 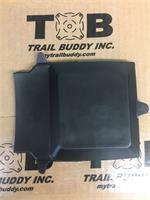 Replacement Rubber Gasket that installs between the taillight bracket and taillight lens. #7 in the diagram. Sold individually. Will fit: CT70 1972-1982; CT90 1969-1972; 1974-79; ST90 1973-1975. Taillight Bolts: OEM92101-050200A. Replacement Rubber Frame Lid/Battery Cover. Designed to mount on a CT70 1970-1973 and a ST90 1973-1975. It is number 8 in the diagram.